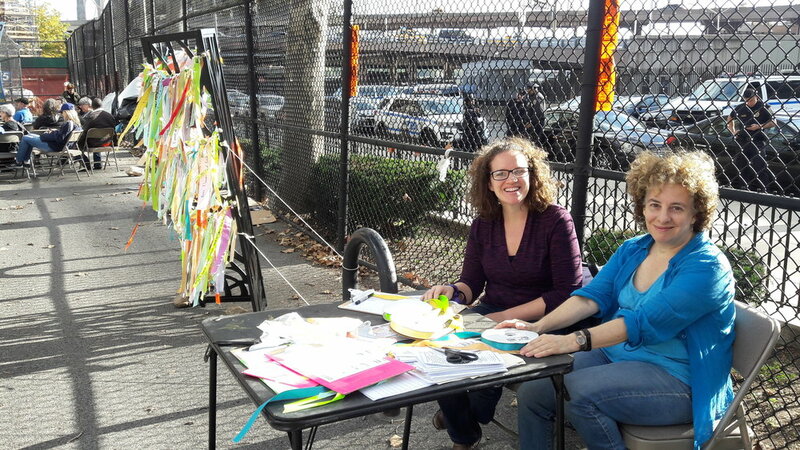 The Climate Ribbon participated in an important event commemorating the fifth anniversary of Hurricane Sandy in New York City – “We Remember, We Resist, We Rise” (#Sandy5). Over 3,000 attendees gathered to honor the people affected by one of the worst storms in U.S. history, and to demand bold climate action from Mayor de Blasio, Governor Cuomo, and Senator Schumer. Following a rally in Brooklyn’s Cadman Plaza Park and a march across the Brooklyn Bridge, attendees congregated at the Alfred E. Smith houses, a housing complex that was severely impacted by the storm. We wish to thank our four incredible volunteers who helped set up, explain the CR to interested passers-by, and close down shop afterward: Sally Gellert, Becca Lynch, Brenna Cohen, and Caron Atlas. It was such a great help to have you there. Thank you again!